We have officially been invited to our first spring party! Our dear friends purchased a new home over the winter and they are finally ready to have everyone over to celebrate! The kids are ready to enjoy the large backyard and the adults are ready to visit in the fresh air! In order to make it less formal and more about enjoying everyone’s company in the nice weather our hosts have chosen to make the party potluck. Everyone is bringing a little something to share. Our youngest host has even requested that each of the kids bring their favorite game to share. The kids have decided to bring their colorful parachute (you remember running under these as kids?) to share with their friends, and one large beach ball to try and float above the parachute. They love throwing the ball; high in the air and running under the parachute as fast as they can. Personally I think it is the perfect Spring activity. It is even great for a variety of age groups. Now comes the food. I love dessert, and as we have food allergies in our home I tend to bring the items I want to eat the most so that I know I can partake without any issues. In our house that means no dairy and no gluten, and as most desserts have those as their main ingredients I try to bring a dessert that will allow us to indulge without fear. I have become a fan of Eat Your Hartt Out which is a fun blog featuring a foodie Dad that just wants to create family friendly recipes for his growing fam. I love that! While the recipes are not always allergy free they can be easily substituted to create allergy-friendly meal options. This month I want to share the Easy Mini Fruit Tarts. These are a fun and simple treat that are easy to work with. While these recipe calls for cream cheese and sour cream they can be easily subbed out for Daiya Cream Cheese and Coconut Cream Yogurt. We also love Pamela’s Gluten Free Cookie Dough Mix. By swapping these ingredients for allergy-friendly ones we can all enjoy, and the flavor is still right on point! Head on over to Eat Your Hartt Out for more fabulous recipes. You will love all the easy and fun recipes that they highlight. They even offer incredible videos! Enjoy! This entry was posted in Food & Recipes and tagged allergy friendly dessert, desserts, eat your hartt out, food and recipes, potluck, spring treats, sweet treats, the boys store, treat recipes on March 25, 2019 by Lacy. We love international cuisine n our house. We love getting to go out to eat Chinese food, Thai food, Sushi, and Korean food. But that can get expensive, especially when you are buying food for 5 or more people. Restaurants are great, but we love being able to get the restaurant style food we love at home too. 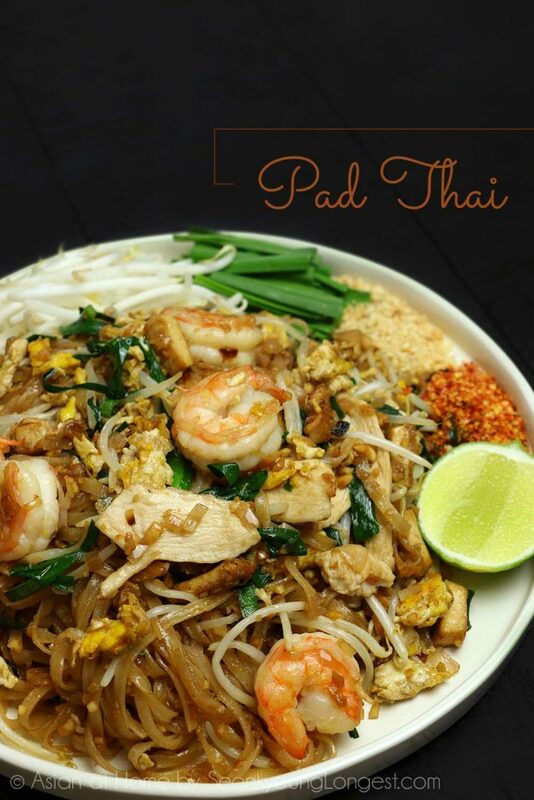 Recently we stumbled upon a great Pad Thai recipe that keeps our Thai cravings to a minimum. It is a great and simple dish to make, and it can be fed to larger groups very easily. The best part about this recipe is that you can alter it to fit your family and their tastes. My husband loves Pad Thai but cannot stand having too many beansprouts, my kids favorite part is the shrimp and most restaurants only give one to two shrimp per person, and I love all the extra veggies. So when I make it at home I can make more of what we love. This recipe is from Seonyoung Longest, a blog written by Seonyoung that features some of the MOST amazing Asian dishes you will ever taste. She even has recipes for drinks and desserts. You will love all of the amazing videos and tutorials she uploads. It makes it so much easier to see exactly how it should be done! These are very traditional recipes and taste amazing! Be sure to check them out when you get the full recipe and tutorial for Pad Thai. You will be glad you did! This entry was posted in Food & Recipes and tagged asian recipe, easymeals, international cuisine, noodles, recipes, seonyoung longest, simple meals, thai food, the boys store, weeknight meals on March 4, 2019 by Lacy. We love a good steak, but since steak can be expensive it is always great to find an amazing recipe that will allow you to take a poor cut of steak and make it taste fantastic. It is a great way to stretch your dollars and still enjoy a good steak. This skillet meal is fast, inexpensive, and delicious. Three things that truly make a great meal. This meal is so simple you can make it in a rush, which is great because most weeknights are a rush for us. I love finding meals that I can make on a Tuesday but taste like a Saturday. you know the kind. The kind of meal that tastes date-night worthy but can be made to feed your family of five? This is one of those meals. Thank you to Eatwell101 for the amazing recipe that can be made very simply. head on over to Eatwell101 now for the full tutorial. Trust us, this is a meal that will wow any day of the week. just try not to forget to set the alarm for the next day, even though it tastes like a Saturday night meal does not mean its a Saturday night. This entry was posted in Food & Recipes and tagged buttersteak, easy week night meals, eatwell101, food, food and recipes, meals, recipes, saturday night meals, simple dinners, simple meals, skilletmeals, the boys store, week night meals on February 19, 2019 by Lacy.